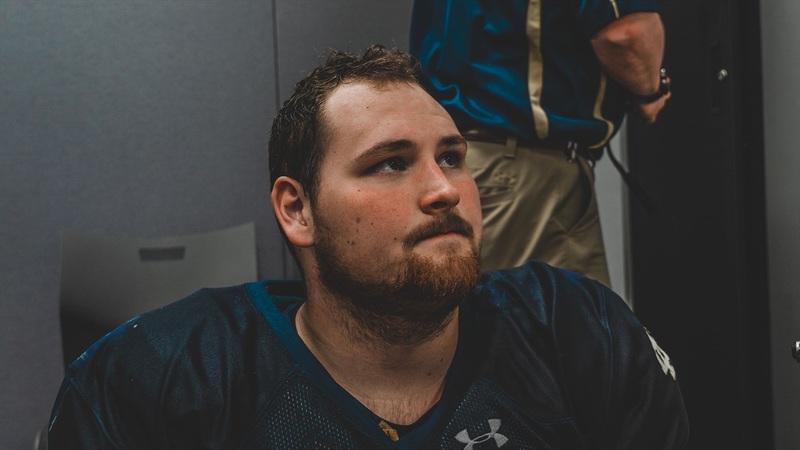 Notre Dame offensive lineman Tommy Kraemer made the move to right guard last spring and it came with much excitement as he would be able to team up with Robert Hainsey at right tackle for years to come. The 6-foot-6, 319-pounder admits he struggled to start the year and combined with an ankle injury, but he rebounded to finish the second half of the season with momentum. Offensive coordinator Chip Long challenged Kraemer to work this offseason to become a better player in space as the Cincinnati native wasn’t able to pull with consistency at times in the fall. “He had to move better,” Long stated. “I like to pull our guys and we weren’t very good last year. I don’t want to lose that part of our offense. If he wanted to be a guy, he needed to do it. Kraemer will be the first to agree with Long’s assessment and put in the work this offseason. The former five-star prospect is heavier than last fall but is moving quicker, which is an excellent omen for the Irish. Putting in the work is one thing, but transferring it to the field is the true test. Kraemer was very confident his work has translated this spring and will get to show the nation on Saturday. Heading into his senior year, Kraemer has also taken on a leadership role in the offensive line room. Kraemer isn’t going to be the most vocal, but he’s been tasked with bringing along four offensive line early enrollees this spring. What’s the next step for Quinn Carroll, Zeke Correll, Andrew Kristofic and John Olmstead? Kraemer is also getting used to playing next to a new center in Jarrett Patterson, who has impressed just about everyone this spring.